“A.C. Frieden writes settings better than any thriller writer I know. From North Korea to Chernobyl to Ukraine and post-Katrina New Orleans, Frieden’s ability to add the most telling details to a scene cast a spell that kept me glued to the page. Set in the recent past, The Pyongyang Option is not just a compelling espionage thriller, but one that neatly foreshadows the shifting, murky alliances intelligence officers are grappling with today. Don’t miss it.” —Libby Fischer Hellmann, author of the Jump Cut and War, Spies & Bobby Sox espionage thrillers. “Jonathan Brooks is the kind of character you’d follow anywhere. And A.C. Frieden serves up another delicious tangle of multi-layered suspense, international intrigue, regional flair, and heart-pounding action. A top-notch thriller.” —Lisa Towles, award-winning author of Choke and other books. Also check out Lisa’s interview with author A.C. Frieden. To purchase the paperback or ebook today, click here. For more book trailers and additional information on THE PYONGYANG OPTION and other titles in the Jonathan Brook series, click here. 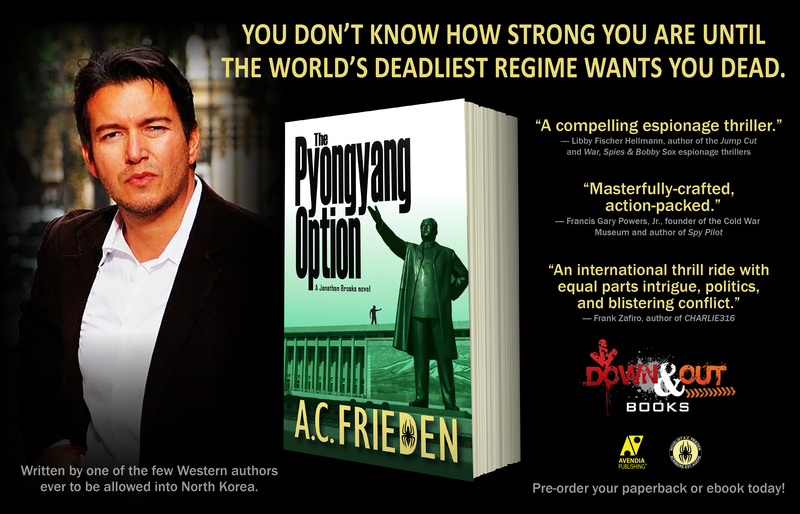 My latest international spy thriller, The Pyongyang Option, will be released on March 29, 2019, by Down & Out Books and Avendia Publishing. As the third book in my acclaimed series featuring New Orleans maritime attorney Jonathan Brooks, this action-packed thriller takes readers on an intense journey through North Korea and Ukraine. To research this book, I became one of the few American authors allowed into North Korea, where he investigated sites in the capital, Pyongyang, the nation’s second largest city, Kaesong, and the communist portion of the DMZ. I also spent time investigating Chernobyl’s exclusion zone in Ukraine, including the abandoned city of Pripyat. In The Pyongyang Option, attorney Jonathan Brooks is desperate to rebuild his law firm after the devastation of Hurricane Katrina. Short on clients, he takes the only work he can find: a business deal in Ukraine. But soon after he lands in Kyiv, his client’s executive vanishes. Suspecting foul play, Jonathan enlists the help of a U.S. diplomat. But the next day they are brutally ambushed by unknown assailants. Injured and racing against the clock, Jonathan embarks on a frantic search for clues through the back alleys of Kyiv to an abandoned town near Chernobyl. Meanwhile, Jonathan’s ex-wife Linda, a journalist, arrives in North Korea to report on historic nuclear disarmament talks. She begins probing local officials, not realizing that she and Jonathan are both on a collision course with a deadly web of hackers, spies and assassins. To uncover the truth and save them both, Jonathan may have only one option: to go to Pyongyang with as much leverage as possible and try to make it out alive. I plan a series of launch events, starting at suburban Chicago’s Centuries & Sleuths Bookstore on April 14 with fellow Down & Out Books crime authors T.G. Wolff, M. Todd Henderson and Trey R. Barker. Other 2019 book signings and events in the Midwest region, as well as in New Orleans and Washington, D.C., will be announced soon. The Pyongyang Option is available now for pre-order in paperback (mass market ISBN: 9780974793429; trade ISBN: 978-0974793481) from Amazon.com and other retailers and eBook on Kindle (US and UK), Nook, Kobo, and iTunes, and thereafter both online and at independent booksellers nationwide. A.C. Frieden is an international author of mysteries and thrillers, including the acclaimed Jonathan Brooks espionage series (Down & Out Books; Avendia Publishing). Frieden is also an attorney, private pilot, PADI scuba instructor, martial artist, equestrian and former army sniper. He was born in Senegal and raised in India, Brazil, Switzerland and England before moving to the United States in his teens. Today, you ll often find him in a far-flung hotspot researching future books, like his recent investigative travels to North Korea, Russia, Cuba, China, Qatar and India. He has faced the chaos of a Central American coup, piloted small planes over the Andes and the Panama Canal, explored remote underwater sites in the Indian Ocean, surveyed the damaged Chernobyl nuclear power plant, followed the Che Guevara trail in Bolivia, tracked down drug traffickers in Paraguay, explored former Soviet missile bases, and much more across nearly 80 countries. Frieden is a member of Mystery Writers of America, International Thriller Writers, and the Military Writers Society of America and participates regularly in literary events in the U.S. and Europe. He speaks French, English, Portuguese, Spanish and some Russian, and carries several passports. 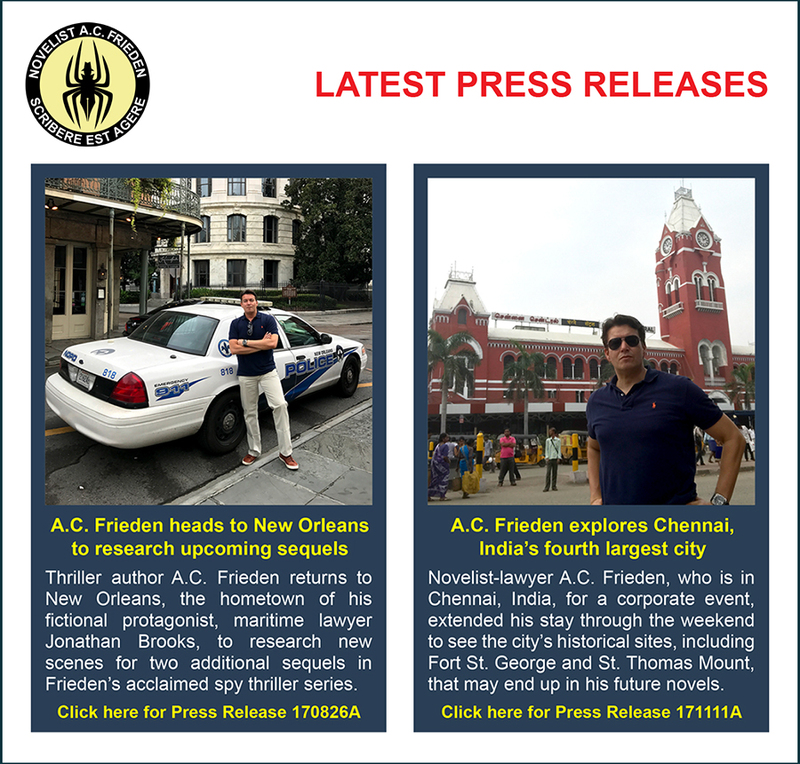 Here are two recent press releases about my book research in New Orleans, Louisiana, and Chennai, India. While New Orleans is already featured in two of my spy novels, so far India has not. So, after over a dozen trips to India in the last three years, it’s about time I add some scenes from one of its interesting cities.